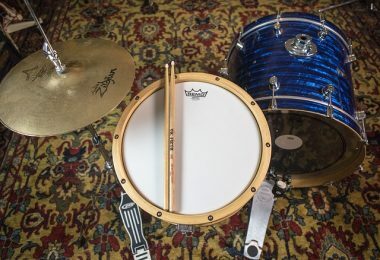 As a drummer, it’s important to know about music production. In this article we will look at the best MIDI pad controller options to get you going. 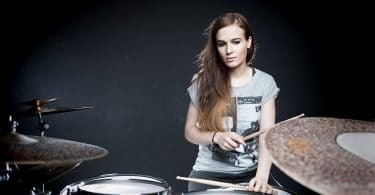 In this day and age, it takes more than just being able to play the drums to put together the next big hit, a drummer must wear many different hats to get their drums sounding just as crisp as in a live performance. As a matter of fact, music production is one of the most important roles that any musician worth their weight in salt should strive to master, or at the very least, learn. In this article, we will be taking a look at one of the most important tools in a drummer / music producers arsenal. That’s right we are going to be talking about the MIDI pad controller! The good news is that midi beat pads are actually fairly easily to learn how to use and can be just as easy to master with some time and dedication. And no, you do not need to make electronic dance music to use one of these beat pads. 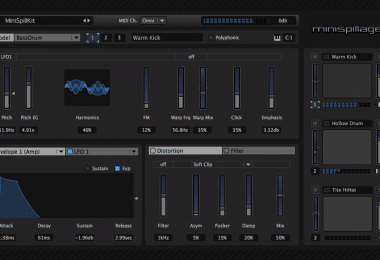 In all actuality, you can take your music to a whole new level through the use of filters, speeds, and whatever else your DAW plugins can through at it. So, without further ado, let’s take a peek at our picks for best midi pad controllers for 2019! The BeatStep Pro is our pick for best overall midi pad controller, and for very good reason. For starters, this midi pad comes packed with three step sequencer channels. Two of these are melodic sequencers (a total of 64 steps per sequence), while the third is actually a drum sequencer that features 16 individual drum channels. Every one of these sequencers are placed atop 16 beat pads that are sensitive to both pressure and velocity. Also aboard this beast of a midi controller, you will find 16 step buttons and rotary knobs that are fully customizable and equally as sensitive to the touch. And for those of you who like to get really creative, there is a real-time looper aboard alongside a roller touch strip so you can change the resolution of your drum rolls. Or, take advantage of the Arpeggio feature instead to create rich fills on the fly! The BestStep Pro is our top pick for best overall midi pad controller due to a wealth of features (only a portion of which we could list here), customization, and the crisp, clean sounds it is able to produce. Whether you are just embellishing a track and adding more tone to your natural drum tracks, or you are performing live, you should not be without the BeatStep Pro. 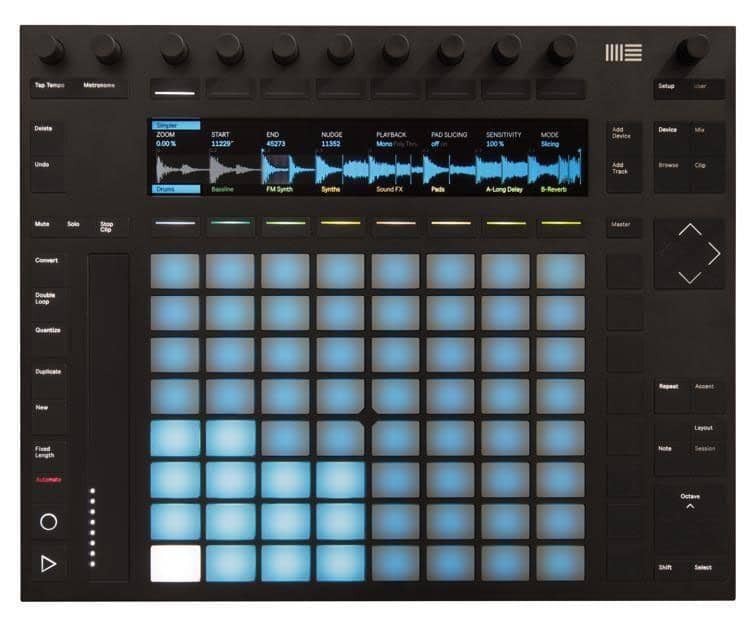 Ableton Live is without a doubt one of the most premier brands in the electronic music production industry, so it is no surprise that the Ableton Push 2 midi pad controller has found its way onto this list. 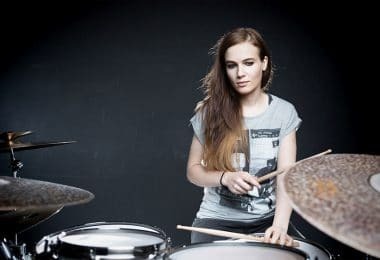 They have made such a name for themselves over the years that top DJs such as Diplo, Deadmau5, and Skrillex all use Ableton software during either live performances or while hanging out in the studio mastering tracks. Packed in this lightweight yet durable anodized aluminum shell you will find a wide array of velocity-sensitive soft silicone pads that feel simply nice to put your fingers on and respond to the even the lightest touch. Seriously, if you are looking for a solid finger drumpad, this midi controller is the one you want to get your hands on, literally. Every one of the pads onboard are backlit in RGB, making them easy to see in low-light conditions such as during a performance in a dimly lit venue. Across the pads, you can slice your samples up, warp them or even play one-off notes and the Push 2 will ensure that all of your sounds sync up perfectly across the board and stay in-time with the rest of your song or track. Lastly, the digital color readout displays your device parameters and reflects the changes you make in real-time. The screen is ultra-responsive, bright, and can be further customized to your liking. We could go on and on about all the best features of the Ableton Push 2, but it would take a blog post all its own to touch on all that greatness! Not quite convinced? Get your hands on one today and let us know what you think! 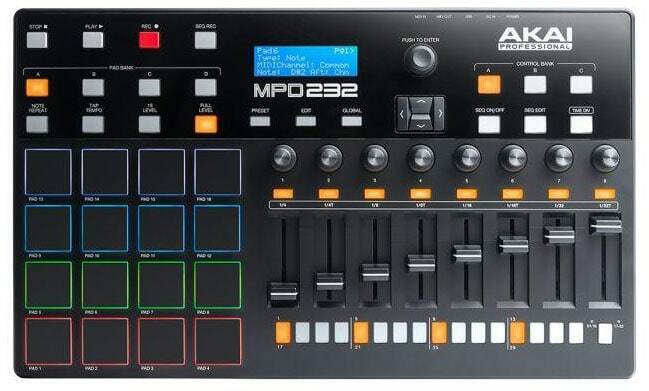 The Akai MPD 232 is one of, if not the most budget-friendly MPC-style usb drum pad, making it suitable for professional use while remaining well within the budget of most serious musicians. Featuring a wealth of goodies such as 64 assignable pads with a total of 4 drum banks, assignable faders, 30 different presets, a full 32-step sequencer, and 16 Thick Fat RGB backlit pressure and velocity sensitive MPC drum pads, this usb drum pad is all you would ever need and more. To really tie the package together properly, the fine folks over at Akai have also included Ableton Live Lite and Akai Pro MPC Essentials software to get you up and running quickly. How’s that for a deal? Next up on our list is a neat little drum pad that we like to believe may just be the best of the dj beat pads out there. This thing may look a bit wild, but let me assure you, it gets the job done! 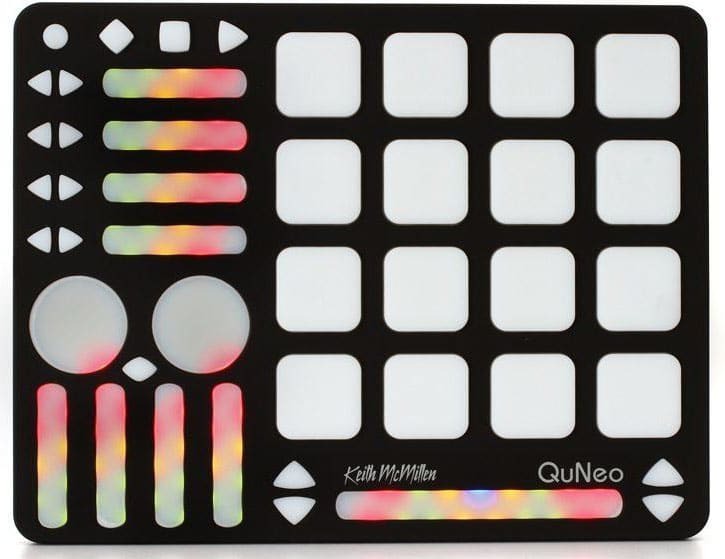 Designed by Keith McMillen, the same guy that was behind the Zeta Music electric violin, as well as the first programmable audio mixer and router, the QuNeo has taken the electronic music by storm in the last year or so. 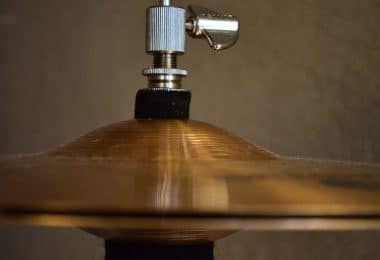 For drummers who just want to lay down some drum patterns and do not understand or want to be hindered by a wide variety of tools that they will likely never use, this minimalistic drum pad is ideal. All white buttons and drum pads are placed in a 4x4 array amidst a solid black shell. When you fire it up though, a stunning display of LED backlights give you all the visual cues and feedback you need to help your creative processes flow with ease. 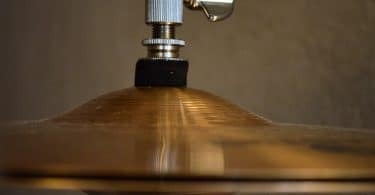 All the sensors on this drum pad controller, from the pads to the sliders and rotary controls are equipped with patented Smart Fabric sensors which are sensitive to pressure, position, and velocity. One of the biggest things that makes this finger drumming pad stand out from all the rest is its size. Borrowing from the ever-popular design of the iPad, this is the slimmest, almost paper-thin, beat pad I have ever seen. Saving the best for last, this list would not be complete without at least a mention of the best midi pad controller for beginners! It makes for an excellent gift for the drummer who is looking to expand their horizons. The Arturia MiniLab MK2 is a big machine, all packed into one slimmed down design that is designed to be easy for any beginner to start playing around with and pumping out tracks with little effort. The slim profile of the shell also makes this probably one of the most portable midi keyboards on the market at the moment. Onboard, there are 25 high quality slim-keys that are controlled mechanically to give you that feel of resistance you would get out of a traditional keyboard or large synthesizer. When you get ready to slap some drums on your track, the MK2 comes with 8 midi beat pads that are backlit in RGB. The pads are pressure and velocity sensitive which will give your tracks a more natural and dynamic feel. 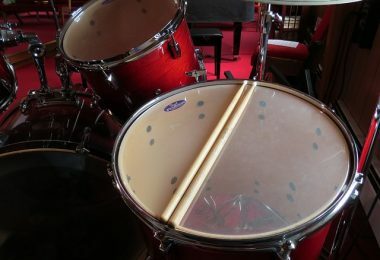 Furthermore, you can switch back and forth between 2 internal pad banks bringing a total of 16 drum sounds under your command. Lastly, the encoders on this midi keyboard are phenomenal for something that is geared toward musicians who are just discovering or starting to use digital tools in their music production processes. There are a total of 16 rotary encoders above the drum pads to give you full control of things like LFO speed and depth, and the cut off and resonance of your filters or other effects. These rotary knobs can even be used for controlling your digital audio workstation (DAW), and comes pre-mapped for Ableton Live Lite and Analog Lab Lite. 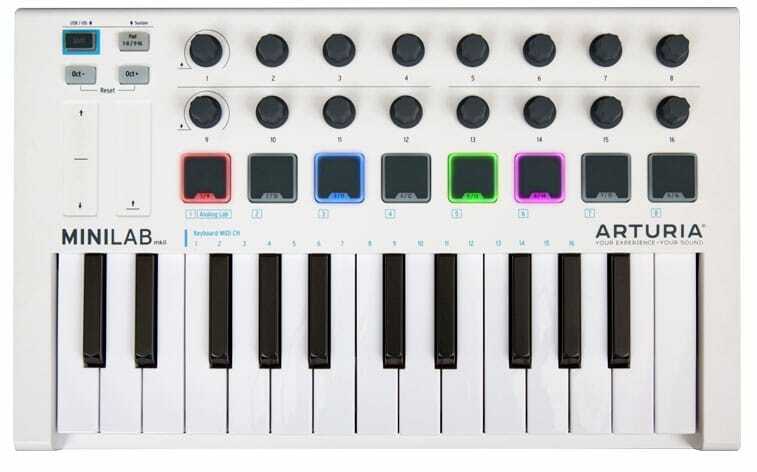 Easy to use, robust, and ultra-portable, the Arturia MiniLab MK2 is, by far, the best midi keyboard controller for beginners. When searching for the best midi pad controller, it is important to first have an idea and understanding of how you are planning to use it. Will you be taking it on the road to your live shows? Do you need a bunch of bells and whistles, or do you prefer something a bit more simplistic to get your feet wet? Analog or digital? A mix of both, maybe? Being able to answer these questions and then comparing them to this list will help you make a much more informed decision when the time comes to make your next great investment. Do you feel that we left a midi pad out of this list that truly deserved the title of best midi pad controller? Drop us a line and let us know about it! We love hearing feedback from our fellow drummers!